One of the problems we have in Wyoming is that our state government is deeply fiscally involved with local governments. This is not unique to our state; it is a pervasive problem across the country. Likewise, the federal government is deeply involved with states, sending north of half-a-trillion dollars to state and local government coffers each year. This is a problem that has been neglected by us in the public policy business, especially with reference to how it complicates reforms to government spending. For example, the funding model for Medicaid is a contributing factor to the resistance among some members of Congress to any reforms to Obamacare. We have a similar situation in Wyoming, though it is primarily not a matter of Medicaid funding. In our case it is at least partly related to school funding. Spending reforms aimed at eliminating the deficit in the state budget must, one way or the other, affect local government spending as well. There is another reason why we need to include local governments. Of all non-federal government spending in our country, amounting to $3.66 trillion, local governments are responsible for $1.8 trillion, in other words just over half. 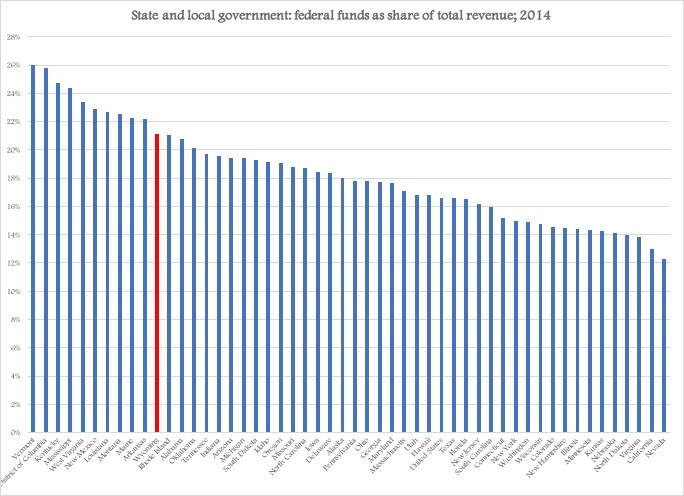 In Wyoming, the distribution between state and local spending is a bit more biased toward the state. Measuring the total size of government by means of its collected revenue, in 2014 the sum total for non-federal governments in Wyoming was $10.3 billion. 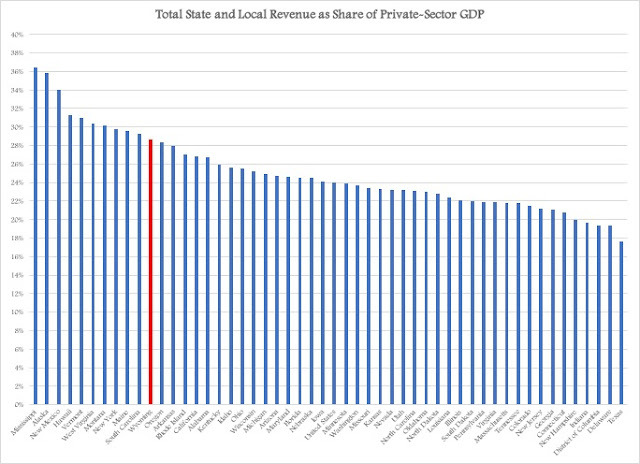 Of that, the state collected $7.45bn while local-government revenue added up to $4.76 billion. If we adjust for state funds to local governments, we end up with a total of $10.3 billion. This amounts to 24.5 percent of our state GDP, or 29 percent of the total value of private-sector activity in the Wyoming economy. Sources: Census Bureau (revenue) and Bureau of Economic Analysis (private-sector activity). Constitutionally, it is essential to separate the state level from local governments, but the constitution does not prohibit different levels of government from becoming one and the same entity from a fiscal viewpoint. In 2014, for example, local governments in Wyoming received almost $1.9 billion of their total $4.76 billion worth of revenue from the state ($1.74bn) and from the federal government ($134m). This amounts to almost 40 cents of every dollar that counties, cities, towns and school districts spent in that year. In times like these, when the state government is strenuously trying to deal with a structural deficit in its budget, it is easy to overlook the consequences that this deficit has for local governments as well. Even more importantly, though, is the problem that the state is presented with when it has taken on spending obligations on behalf of local governments. We know that local governments suffer from the current economic crisis in our state; the fact that the state government is in dire need to reduce its spending only aggravates the situation. With this in mind, it is even more important to solve the state's fiscal and economic crisis by means of reforms that reduce both state and local government spending. School-choice reform is an excellent example of how we can solve two Gordian Knots with one cut. One complicating factor about federal funds is that they include severance taxes. Every federal agency that reports on federal aid to states includes federally distributed state-sourced severance tax revenue in the funds that the U.S. government generously provides the states with. I am not going to argue the legal definition of that portion of our severance-tax revenue; let me just point out that from a fiscal-independence viewpoint, it makes no sense that those tax revenue first go onto the federal government's books and then are paid out to the states. It makes us vulnerable the day the federal government decides that they need the money more than we do. Sure, there would be a legal battle and it would probably go on for a while, and the outcome would probably be in Wyoming's favor. But during that period of time we would have to live without billions of dollars, in accumulation, that would drastically worsen our fiscal situation. Every time I bring up this point, I am told by assorted experts and pundits that it will never happen. My response is that I hope I am wrong, but also that the United States has yet to experience an urgent fiscal crisis of European proportions. When that happens, legal concerns regarding the jurisdictional status of severance tax revenue will, as they say, be of academic relevance. 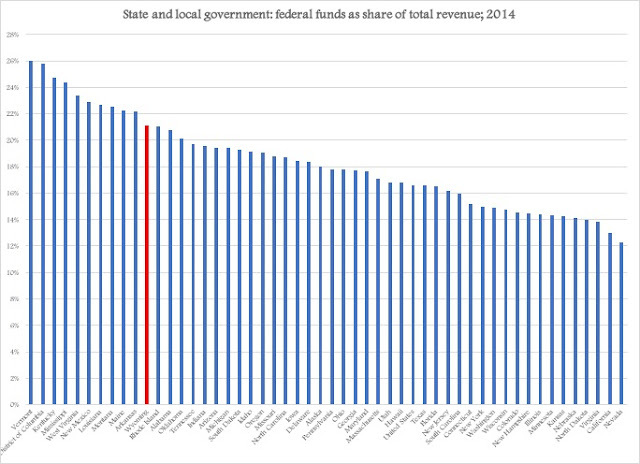 In coming articles, we will look more closely at local government finances in Wyoming. That will help us refine proposals for structural government spending.